9/1/2016 Portland, OR - Willamette Week, Burnside Brewing and Portland Beer Week present the Fresh Hop Pop-Up Beer Fest this September 20th - 24th at 7th and E. Burnside in Portland, Oregon. Featuring an outdoor beer garden, sunny and shaded seating and a rotating daily selection of the finest and freshest hop harvest beers of the season from some of the regions best breweries. 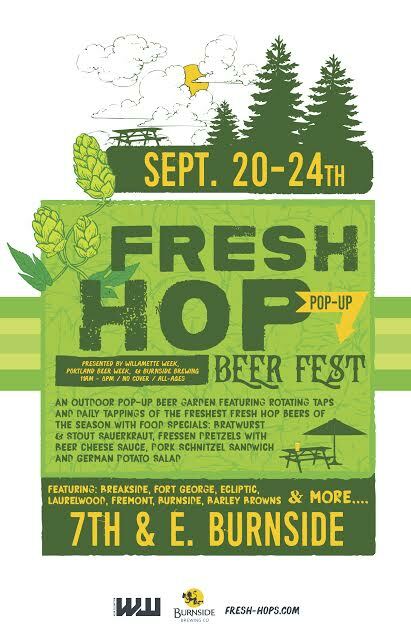 The Fresh Hop Pop-Up Beer Fest will rotate eight taps devoted to the latest, dankest fresh hop releases from the regions best breweries in an outdoor setting with Oktoberfest style street food options in an all-ages environment. Each day will feature atleast one brewery tapping this years fresh hop beers, so there will be something new and exciting every day. The week kicks off on Tuesday, September 20th with Seattle's Fremont Brewing. All beers will be available in two sizes - 16oz pints for $5 or half pints for $3. Cash is preferred but there will be an ATM on site. Introducing Hop-Shine: Boost Your Beer at the Fest! Tues. 6/20 - Fremont Brewing: Tapping 'Field To Ferment' Fresh Hop Pale Ale in two versions, one with Centennial fresh hops and the other with Simcoes. Wed. 6/21 - Laurelwood Brewing: Tapping Fresh Hop Workhorse IPA and Fresh Hop Free Range Red. Thurs. 6/22 - Breakside Brewery: Tapping last years 'Beer of the Year' as chosen by Willamette Week: Fresh Hop Simcoe IPA and Fresh Hop Cascade Wanderlust. Possibly a TBD 3rd fresh hop beer if it's ready in time! Friday 6/23 - Fort George Brewery: The release of Fresh Hop IPA with Amarillos and CoHoprative (mixed fresh hop). A special menu prepared by Burnside Brewing available ala carte for the beer garden pop-up.